The Nederlander Organization is expanding to programming two theatres this year: the Hollywood Pantages (FB) and the Dolby Theatre (FB) at Hollywood and Highland. It will be interesting to see how our seats translate to the Dolby; I’ve never been in that facility. They also seem to be returning to the “Broadway in Hollywood” moniker. People forget the history, but the original Pantages programming going back to the days of Joseph and the … back in 1982 merged with what was left of the Los Angeles Civic Light Opera (which used to program musicals at the Dorothy Chandler Pavilion — in fact, it was one of the original tenants) to create an organization called “Broadway LA“. That name (and the website) was dropped around ten years in favor of only the Pantages name, but it appears to be resurrected in a slightly different form. Here’s the press release. The split between the theatres is interesting. What this seems to be permitting — at least this year — is a long sit-down engagement for Hamilton starting in March while they can still satisfy the subscription base they have built with new shows at the Dolby. This may work — I’m sure the Dolby will have significantly better acoustics than the Pantages; I don’t know about sight lines from the side. But once the juggernauts are gone, what will happen then? The major long sit-down shows will be things like Wicked, Hamilton, Dear Evan Hansen, and such. What others will sustain a long run in this city? This season, I’ve heard the music from all of the shows. 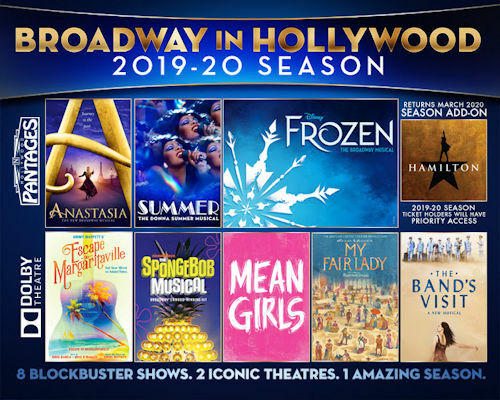 Most of the shows in the season I’m excited to see: in particular, The Band’s Visit, Spongebob, and Anastasia. I’ve heard Frozen has some good effects, but at least based on the cast album, the first act is a bit slow. It will be interesting to see on stage. I like the music to Mean Girls, but it comes across as a Heathers-ish show. I’ve heard really good things about the My Fair Lady revival, and supposedly they’ve addressed the tonal problems in the original, but I’m curious to see how. The music in Escape to Margaritaville is good, but it’s a jukebox musical with little substance (much like Buffett’s music). The least interesting of the bunch is Summer — another jukebox, but with disco. Yes, disco, the music of my college years. This year, I’ll likely get the add on: Hamilton is one musical I won’t mind seeing a second time. Harry Potter and the Cursed Child, Parts I and II . The North America tour is starting in late 2019 at the Curran in San Francisco; it wouldn’t be a surprise to see it come to Los Angeles. Bandstand. There is an announced tour of the show, and it would fit the Ahmanson’s audience well. Head Over Heels. The producers are exploring a national tour; given the programming at the Pantages, this might end up at the Ahmanson. Girl from the North Country. A tour, starting in the fall, is in the works. I could see it at the Ahmanson. I haven’t heard rumors of Angels in America going on tour, but I could see the Ahmanson adapting that and bringing it in as a one-off. They may also bring in some dance show; I think Harry Potter would suffice for the play. There could be a new musical in the mix; they tend to do that. There are some other shows that I could see coming in, but they are too new to be highly likely: Pretty Woman, The Prom, or Be More Chill. Look for my Hello Dolly review by the end of the week. This weekend: Theatrical whiplash, in the form of 1776 and Anna Karenina, both on the same day.